Award winning, accredited and certified Interior Decorator and Design Consultant specializing in creating and customizing the perfect plan to fit any style or budget, Katherine brings diverse solutions and personal attention to all project details, from conception to completion. In addition, Katherine’s team of qualified contractors and professional services ensure that the job gets done right the first time and on schedule - guaranteeing realistic costs and remarkable results. 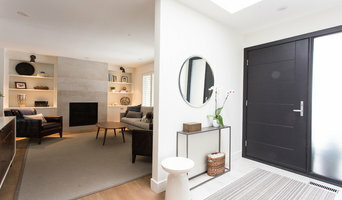 Handpicked by ThreeBestRated.ca "Best Interior Designers in Newmarket, ON"
Since 1973 Olympic Kitchens has been providing timeless cabinetry for any home renovation project. These projects include kitchens, built-ins, entertainment units, bathrooms and specialty millwork. It’s often said that the kitchen is the heart of any home. It’s a place to create a gourmet meal, to plan the family calendar, to share the day’s events, to reflect over a cup of coffee. The kitchen is one place you should feel comfortable. Now that you’re thinking about remodeling your kitchen, you certainly want the breathtaking results you may have seen in other homes or in pictures. But a truly beautiful kitchen is more than skin deep. Real value for your investment includes things like classic styling that will stand the test of time. Flexibility that lets you put your personal stamp on your own kitchen design. Hand crafted cabinets that look as good up close as they do from a distance. Durable surfaces that stand up to repeated cleaning. Functionality that makes things easy to store – and easy to find. We’re proud to say that Olympic Kitchens can offer you all these things, and more. We’ve learned a thing or two over 30 years of building custom kitchens. Most important, we’ve learned that true satisfaction with a kitchen occurs on many levels – and ¬that each level must be addressed right from the beginning. Our clients include architects, interior designers and renovation contractors who understand ﬁne work, and who recommend us to families like yours. The Katsis brothers founded Olympic Kitchens in 1973, bringing with them old world woodworking skills and craftsmanship and a commitment to building only top quality kitchens featuring design excellence, first-rate materials, and unswerving attention to detail. More than 35 years later, Olympic Kitchens is a recognized industry leader with a solid reputation for designing and building original works of art that eschew the ordinary and embrace the adventurous. We believe that great clients are integral to the design process, so we seek them out as we seek to create beautiful work. We engage in architectural design, and love the creative process no matter the medium. We enjoy sites that can respond to the design and vice versa. In Toronto, the Muskokas and throughout Canada, BLDG Workshop pursues the goal of creating architecture that forms a sense of place through responding to client needs, the site and its conditions. Favourite projects often include custom homes, cottages, renovations and additions where the site includes natural features that can become integral to the overall design. We consider sustainability, interior, industrial, and landscape design as instrumental in our work as we approach projects in relationship to their context. We feel the best way to create successful architecture is to embrace a collaborative relationship in which the client’s voice and ideas are heard and implemented. We believe that good architecture should respond to many fundamental and site specific principles; however, at the end of the day, your home should respond primarily to you. Mississauga Award-Winning Interior Designer - Best of Houzz 2016-2017! Fresh. Functional. YOU. Personalized and tailored interiors for the way you want to live. Master Edge Homes is built upon a foundation of expertise and unparalleled craftsmanship. Whether it is a new home build or a renovation, the team at Master Edge Homes meticulously plans and executes every project down to the very last detail. Master Edge Homes understands that the focus of every homeowner is finding a company that provides peace of mind in knowing that the work completed is of the highest quality. With over 110 years of combined experience in the home building industry, the team at Master Edge Homes provides more than just peace of mind. From architectural design, to supervising the construction of subdivisions, our team's experience encompasses every corner of the industry and is truly passionate about offering our combined expertise and knowledge to our clients. Both the front-line staff and behind-the-scenes team are comprised of the most qualified individuals dedicated to ensuring your home project is completed with the utmost care. At Master Edge Homes, we treat every home as our own. To learn more about what we can do for you, contact us at 905-201-1054. M & D Builders has over 20 years of both commercial and residential experience with a focus on quality. We offer a complete package of drawings to get your building permits and a full range in the construction industry as a general contracting company. We offer competitive rates, experience, quality, and professional workmanship. We will provide you with a clear and complete quote containing all aspects of your project. We work closely with our clients to ensure total satisfaction on every project large or small. If you require a professional, experienced and reliable company for your next project, please contact M & D Builders to schedule an appointment today! Our team works closely with every client from the start of each project. We establish clear goals, and manage the process to those goals, to ensure that the end result perfectly reflects our client’s unique vision. We understand the importance of setting expectations, defining budgets and offering great value on the final elements for your space. We firmly believe in building relationships with our clients, builders and manufacturers. We insist on product quality and design integrity. Well known and respected for creativity and professionalism our team consistently demonstrates first class behaviours, which is reflected by our highly loyal clients and their referrals. Affecting Spaces is a boutique design firm that specializes in providing you with the best in exclusive and customized design. Every project is uniquely approached with a focus on aesthetics, functionality, cost, and of course, your own personal tastes and needs. We have also partnered with RenoBible.com - A new design service that provides beautiful designs and the associated construction packages at irresistible prices. Check out Reno Bible on Houzz! Fresh. Functional. YOU. Personalized and tailored interiors for the way you want to live. Eva graduated from York University with a Bachelor of Arts with an Honours Double Major in Psychology and Law & Society. She then went on to receive her Diploma in Interior Design from the Academy of Design and Technology. 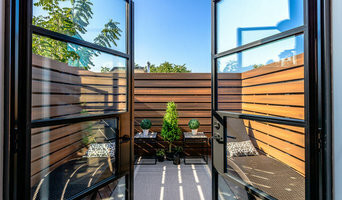 She had previously spent some time with a prestigious downtown Toronto architectural firm as well as worked in several boutique residential design firms. After gaining industry experience and a long list of satisfied and happy clients, she decided to branch out on her own and created avenue design inc. Located in Oakville, Ontario, avenue design inc caters to clients all over the GTA and focuses mainly on Modern high end residences. 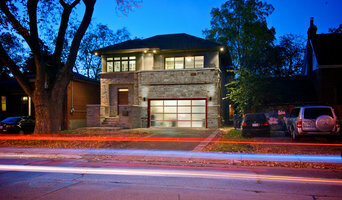 From its conception in 2010 by Josh Theriault, an architectural designer with over fifteen years of construction experience, First Lines Design has grown into a team comprising of highly dedicated individuals committed to delivering high quality innovative designs and efficient building permit services. Whether it is a simple addition to your home or an entirely new residence, we can provide assistance from the ground up in actualizing where and how you want to live. We take great pride in the work we do for our clients and we place a great deal of importance on meeting deadlines and delivering superior results. We understand that the home is a valuable and highly personal investment; this is why FLD strives to deliver an outstanding cost-effective product for every client’s budget. Bringing years of experience to the constructions industry UPSIDE Inc. is an upscale boutique company to reflect today's needs and customer demands that strives to deliver an exceptional product. Today's trend is shifting towards bright, modern and relaxed living. Spaces are defined by comfort, chic interiors, advanced technology and environmental attributes. Our projects reflect the dedication and high end quality that our company is based on. With a dedicated philosophy of quality and complete indoor/outdoor living, our passion is building the right home for you. Soda Pop Design Inc. is a full service Interior Design studio that focuses on delivering innovative solutions that enhance the way our clients live, work and play. Taking pride in our ability to connect and understand the individual needs of our clients, the result is a space that celebrates the people using it. We live in a culture of permanent change - our spaces should be fluid, adapting to our lives and enabling us to focus on living. At Soda Pop Design, we do not design to trends - we design to the individual. Our tailored approach to the design process ensures our clients are as involved in the process as they wish to be. Working closely with trades and with access to exclusive sourcing, we strive to make the design process a positive experience from start to finish.